If you’re looking for a show that will make any demographic burst into laughter, look no further than the new comedy on TruTV, “I’m Sorry.” The show’s focal point surrounds the life of the main character, creator and writer, Andrea Savage who portrays her real life scenarios as the character “Andrea”. Pictured: Andrea Savage with Tom Everett Scott. The pilot introduces us to Andrea’s life as a wife, mom and comedy writer in Los Angeles, who comically exposes her inner immaturity through unexpected situations she was not prepared for. For instance, her open and unfiltered nature accidentally gets her into situations beyond her control. During the premiere episode, Andrea finds out one of the other moms at her daughter’s school, Melissa (played by Gillian Vigman), has a dirty dark secret from her past. 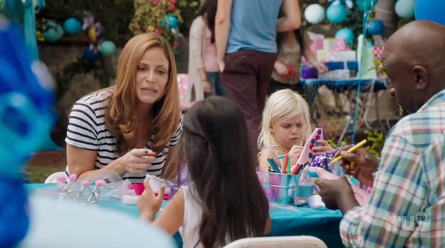 Melissa’s secret gets outed in the worst way possible at a birthday party thrown by another mom, Maureen (Judy Greer) for her daughter where most of the parents and their kids from the same school are in attendance. Once the secret is let out and other parents are notified of Melissa’s past via an email, Andrea tries to do the right thing by investigating on who let out Melissa’s personal information. However it backfires on her because it appears that she herself sent the email. “I’m Sorry” is the raunchier, cable version to 1990’s sitcom “Seinfeld”. A show that claimed to be “about nothing” because it so famously made fun of the everyday quirky life situations of four friends. “I’m Sorry” is similar in that it exaggerates everyday events, typically within a family unit, yet with a twist that is comically unfiltered and enhanced by a slew of character actors. Tom Everett Scott plays the role of ‘Mike,’ Andrea’s straitlaced husband who embraces her shenanigans. Olive Petrucci plays the role of ‘Amelia,’ Andrea and Mike’s daughter who will be a series regular this season. Actor Jason Mantzoukas plays Andrea’s unapologetic, unpolitically correct writing partner Kyle. Other hilarious cameos in the first episode include Judith Light who plays a member of Andrea’s dance/workout class, and June Squibb is the easily offended little old lady. Pictured: Andrea Savage in dance class scene. After speaking to Andrea at the “I’m Sorry” red carpet premiere, she told us she based this show off true stories of her own life. Andrea wanted to create a show based of of what her life as a mom was really like compared to the mundane roles television casts for moms. It was then that she decided to create her own opportunity and become the lead actress, writer, producer and overall creator of “I’m Sorry.” Her wit, charm, and hilarious lack of filter is what makes her character on and off the camera so vibrant. In episode one, after Andrea says something racy to Mike, he playful scolds her, “you are somebody’s Mother!” To which Andrea replies “I forgot, Moms aren’t supposed to be funny.” Joining Andrea as executive producers are Andy Samberg and Will Ferrell. “I’m Sorry” premiers on Wednesday, July 12 at 10 pm ET/PT on TruTV.